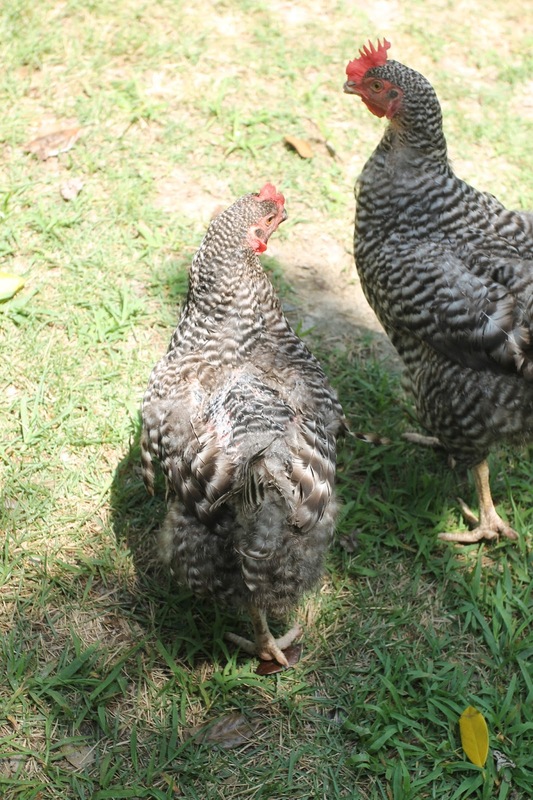 So, few weeks back we added three, new "slightly used" chickens to our flock. We weren't sure how it was going to go with integrating them into our already established flock. Some people told us it was going to be impossibly hard. Still, we held fast to our optimism and proceeded. At first, we tried to quarantine them from our others chickens. That lasted about four days. Maybe. Once our Chickens of Downton Abbey sussed out our newbies, they wouldn't leave them alone. So, we moved them into side by side cage living a week early. They lived side by side like that for just under two weeks. In those two weeks, we got our new gals used to be handled. They were pretty afraid of us at first and they are still a bit shy, but they are really getting the hang of our farm life. I'll admit, I had my doubts. When they came to us they were in pretty shape...but the feathers have grown back and as they have, their attitudes have improved as well. Last week, we took the big plunge by integrating them. So it's official, we've got a unified flock! But I bet you are wondering what we named them. I got a lot of good suggestions on names for my new hens. One of my personal favorites was cutlet, parm, and tender, but since we aren't really going to eat them, it didn't seem to fit. The winning name suggestion came from my mother-in-law. Together, the three of them are our "Bitties!" Their individual names have to do with how many feathers they were missing when we got them. There is "Lotta Bit," "Lil Bit" and "Justa Bit." Cute right?! Still, my husband and I tend to refer to them as "The Amrocks" more than anything else. I am sure that will change with time. For you chicken enthusiasts out there, I wanted to say how I got my chickens to integrate. When I searched online there wasn't a lot of information on how to properly integrate new chickens into an established flock that wasn't overly negative or just plain out there. So, here's how we did it. It was a lot easier than we thought it would be. This one is loving life and lounging in the sun...wing out style! First we put them all in the cage together in ten minute intervals (supervised, of course) about twice a day for two days. Then, we let them have a whole half hour together (still supervised). After their half hour, we let them all out of the cage together to roam the yard. We gave them two days of yard roaming together (unsupervised) to sort out their differences and then we decided it was time to make it official: they were going to sleep together! Now, our newbies wouldn't just go into the house and roost, so we had to physically pick them up and put them on the roost. Our girls were happy to make space. So now they are all together, and it's going really well. The integration system worked really well and now they are one big, happy [henny] family! My favorite part is having the different kinds of chickens. It's just cool.